Congratulations to the Lady Gaels JV basketball team who went 3-0 in taking the title at the Las Lomas JV tournament. Lady Gaels Alyssa Ybarra and Angelina Warlich made the all tournament team. Great job Lady Gaels! The Wrestling program is off to a great start. Zach Little won his weight class at the Varsity tournament in Castro Valley. There were also about 25 wrestlers who competed in the JV tournament in Pleasanton – and came away with 10+ medals and a handful took first. Way to go Gaels! 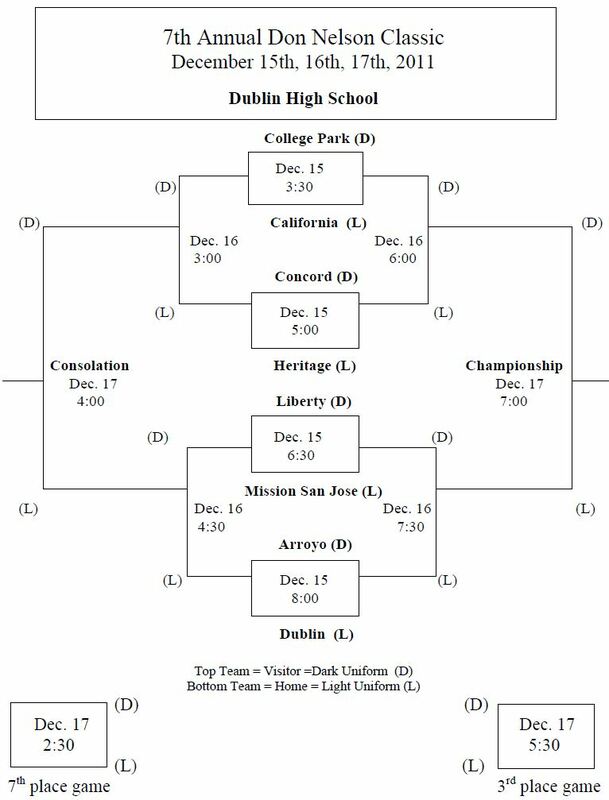 The Men’s Varsity Basketball Don Nelson Classic Tournament starts on Thursday 12/15 and ends Sat. 12/17 (see schedule below). The DHS team has their opener against Arroyo on Thursday night at 8p.m. I have attached the tournament schedule for your convenience. There is a small admission to this tournament but it goes directly back to support the program . Please come out and cheer on this very talented team. You may be asking yourself…who is Don Nelson? Is it a reference to the Warrior’s Don Nelson??? Well no, it’s not. WHO IS DON NELSON? After graduating from Acalanes High School and playing basketball for Sacramento State, Don Nelson joined the Dublin High School staff in 1968. For the next 36 years, Don Nelson worked tirelessly in his role as a Physical Education Teacher, Coach, and Athletic Director. In addition to his accomplishments at Dublin High, Don served as the Commissioner of the Hayward Area Athletic League (HAAL) from 1990-1993, and he has served as the East Bay Athletic League (EBAL) Commissioner from 1993 to the present. He is also very active in a variety of capacities working on North Coast Section/CIF Committees and Championship events. His reliable commitment to high school athletics is highly regarded, and he was elected to the Tri-Valley Sports Hall of Fame in 2007 for all of his efforts. Don always conducts himself with the highest level of integrity, and is an excellent role model for our student-athletes. He has made a difference in the lives of countless people. This tournament was instituted in honor of his legacy as a dedicated lifelong educator with a tremendous work ethic and an enthusiasm for life that is contagious. The Men’s and Women’s Soccer programs will be hosting Frosh/JV tournaments Wed. 12/28- Fri. 12/30. I will send out both tournament schedules when they become available. As always, please think about volunteering a couple hours of your time in one of our snack bars. Profits from the snack bars support ALL sports at DHS so it is beneficial to volunteer even if your athlete isn’t playing a winter sport.